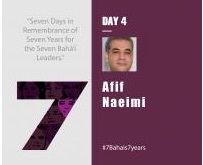 Today is the day the world will honor Afif Naeimi, who has been wrongfully imprisoned since 2008 solely for his religious beliefs, as part of the global “Seven Days in Remembrance of Seven Years in Prison for the Seven Baha’i Leaders” campaign. Afif Naeimi, 53, is an industrialist who was unable to pursue his dream of becoming a doctor because as a Baha’i he was denied access to a university education. Instead, he diverted his attention to business, one of the few avenues of work open to Baha’is, taking over his father-in-law’s blanket and textile factory. Arrested on 14 May 2008 in an early morning raid on his home in Tehran, Mr. Naeimi was sent first to Evin prison and then, after the 2010 trial of the seven, to Gohardasht prison. Mr. Naeimi was born on 6 September 1961 in Yazd. His father died when he was three and he was raised in part by his uncles. While still in elementary school, he was sent to live with relatives in Jordan and, although he started with no knowledge of Arabic, he soon rose to the top of his class. He has long been active in volunteer Baha’i service. He has taught Baha’i children’s classes, conducted classes for adults, taught at the Baha’i Institute of Higher Education, and been a member of the Auxiliary Board, an appointed position which serves principally to inspire, encourage, and promote learning among Baha’is. He married Ms. Shohreh Khallokhi in the early 1980s. They have two sons. Mr. Naeimi was one of seven who formed the entire membership of the now-disbanded ad hoc group known as the “Yaran” or “Friends,” tending to the spiritual and social needs of the Iranian Baha’i community in the absence of formally elected Baha’i leadership, which was banned in 1983. The names of the others are Fariba Kamalabadi, Jamaloddin Khanjani, Saeid Rezaie, Mahvash Sabet, Behrouz Tavakkoli, and Vahid Tizfahm. Ms. Sabet was arrested on 5 March 2008; the others were arrested on 14 May 2008. Each day, a different member of the seven will be commemorated. Tomorrow, 17 May, the campaign will focus on the situation of Saeid Rezaie.